Our gardens may be desperate for rain after a scorching start to autumn in London, but the rather cooler weather with some sunny periods forecast for Saturday (17th September) should be just fine for the annual Street Party. Don’t just rely on the weather and the entertainment on offer when deciding whether to come to the Play Street, just take a look at the range of raffle prizes on offer, all donated by local businesses. 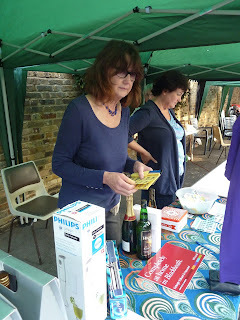 The raffle, along with the food stall, is one of the main fund raisers for the Ashburnham Triangle Association. And all surplus funds from the Street Party will, as usual, go towards good causes in and around the Triangle and, of course, help to buy or hire equipment for next year.